I've lived in Yorkshire for fourteen years now and, while I didn't grow up here, I regularly count my blessings that I'm lucky enough to live in this beautiful place. I'm afraid Yorkshire residents do constantly bang on about how special their county is, and that's because it's true, it is special. We have a seriously stunning coastline. We have the Dales, an area I love to visit as often as I can. We have hills, rivers, moors, beaches and any number of beautiful places to visit. We have a rich heritage, an interesting history and an awful lot of sheep. So when a few weeks ago Yorkshire Water got in touch to ask if I'd like to support their campaign Blueprint For Yorkshire, I was very keen to get involved. It is dedicated to improving water quality, the environment, creating cleaner rivers and beaches, and just generally making Yorkshire better for residents and visitors. It's a long term plan with big aims for a big county. I thought about driving over to the coast. Or up into the Dales, maybe to our beloved Bolton Abbey and the River Wharfe. But those destinations all involve at least an hour long drive, planning, picnics, and a full day out. I wanted to remind myself of what we had closer to home and so we spent Sunday morning walking along a short stretch of the Leeds to Liverpool Canal. It's years since we came here and I'd forgotten how peaceful it is, how slow the pace. I love to visit these pockets of calm within the city of Leeds. Those spaces where you can't hear the hum of traffic anymore (well, barely), where you can see open spaces and greenery. The canal is hugely popular with walkers, runners and cyclists as it's wide, flat and there is no traffic. It's also very popular with five year old boys and their scooters. It was such a mild, hazy September morning and so still, not a breath of wind. The only thing to disturb the water was the odd passing canal boat. A bit later than usual. It's been a busy weekend, and when I did have time I didn't have internet connection for some mysterious reason. It's sorted now - John troubleshooted the problem by turning the modem off then back on again. 1. Blackberries/brambles. (Is a bramble just a wild blackberry? I am always confused by the way these names are used interchangeably). The season is ending now and I've been picking as many as I can at every opportunity. With apples in a crumble, eaten with custard. And in jelly. There was a tiny bit left, not enough to bother scraping into a jar, so while it was still warm and runny I stirred it into some Greek yogurt. It was amazing. And so pretty! 2. We've spent a large part of our weekends lately assisting Bella with her homework. I have to confess I have resented the amount of time we've spent on various projects, but the result was her truly beautiful watercolour copy of a very well known painting by Kandinsky. It is currently stuck in her Learning Log but I've warned her that, at the first opportunity, I'll be removing it, framing it and putting up on a wall somewhere. I like to embarrass her like that. 3. An abundance of gladioli. John came home one day laden down with five bunches. "They were reduced to 15p." he said. So he bought enough to fill all the vases in our house. Part of me was thinking thanks, but did you have to buy so many? One bunch would've been lovely. But you'll be pleased to know I kept those thoughts in my head. 4. Fun with Bella's Fimo modelling clay. I love this stuff! I made a necklace. Something about those colours is very pleasing to me. I hope you've had a pleasant weekend. We've cooked, entertained, drank, laughed, walked, flopped around and generally had a pretty nice time. My approach to stitches - crocheted, knitted or sewn - and colour varies enormously depending on the time of year and what I'm working on. 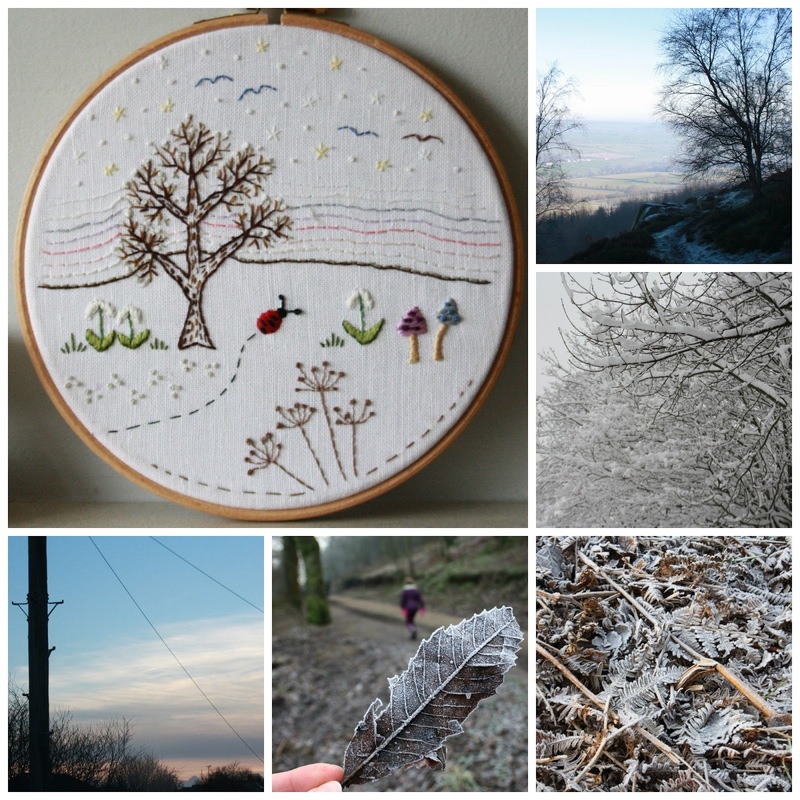 But one thing I have noticed when I look back at what I've made this year, is how strongly I am influenced by the seasons in what I make and in the colours I choose. I find I favour cooler colours in the cooler months, and a wider, more vibrant palate in the summer. 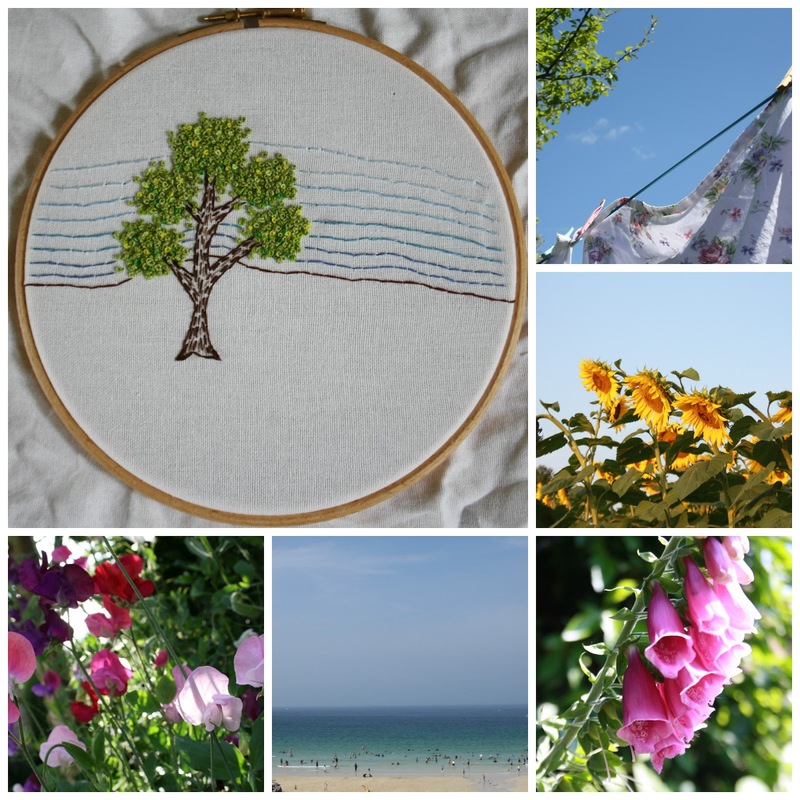 So today I thought I'd focus on embroidery, and specifically my four hoops which feature the same tree throughout the year in different seasons. Thinking about the type of stitches I'd use to draw these scenes was one of the best things about this project, looking at the way different colours and motifs worked in different techniques. I'll start with Autumn, because it's the first hoop I made, it's my favourite time of year and, as I've said before, September always feels like New Year to me. It's the time of falling leaves, berries, fungi, feathers and seeds. Colours at this time of year are rich but fading. They are the tones of the earth; ochre yellow, rusty oranges and reds, muddy browns and greys, with green and plummy purple thrown in. The colours I want now are cosy and warm, mustard yellow and conker brown. Winter is quiet and hushed. It's the season of pale skies, bare trees, snow covered branches and frosty earth covered in leaf and seed skeletons. The colours are still, suspended until spring. Dark greys and browns with pale pinks, lilacs and blues. Hiding but there if you look carefully in sunsets and early snowdrops. 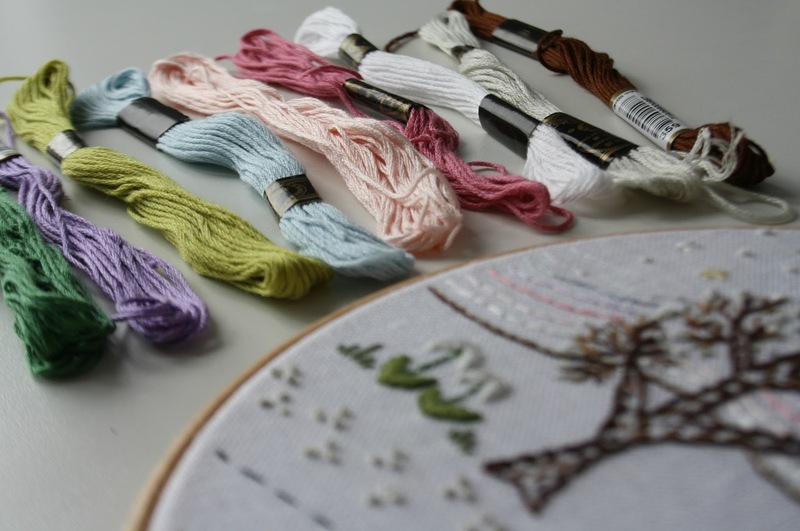 It's not about the colour now as much as comfort and warmth - stitches to soothe and pass the time until spring comes. Spring is for blossom, bulbs, buds and birds. A rainbow of gentle colour emerges after the cold winter as everything wakes up. Blossom pink, daffodil yellow, bluebells and purple grape hyacinths...we are spoilt for choice. I definitely think more colourfully at this time of year. How can you not, when there are tulips and daffodils everywhere you look, and longer days and more hours of sunlight? Ah, summer. Summer is blue skies, lush foliage, bright blooms and bees buzzing. As you can see I am still working on this hoop but I already know what tones and shades I will be using. An English summer is a glorious thing to behold and the colours are bursting, vivid and noisy. Emerald green leaves, jewel-coloured flowers, golden sunflowers and glittering water. 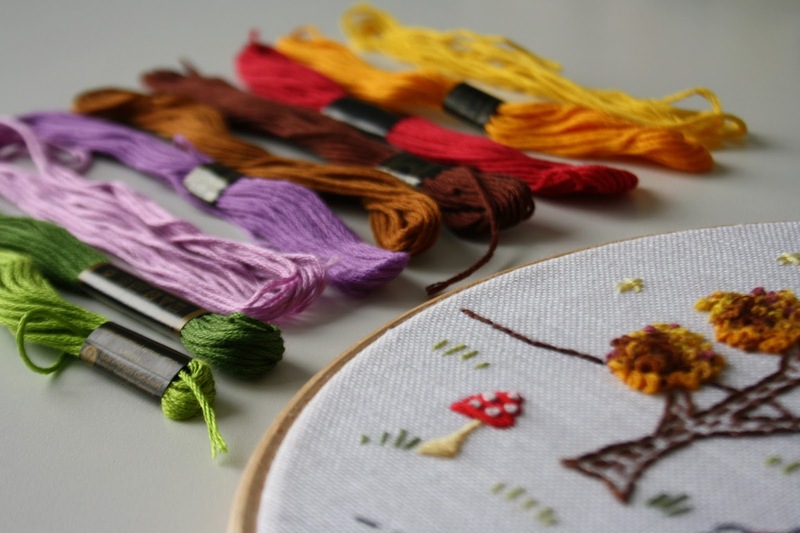 I want stitched projects that reflect my summery mood, vibrant and happy. I tend to think of these four hoops - and the four seasons - as colours first and images second. The colours matter hugely and it's no accident that I've looked to nature for inspiration here. Something I've noticed time and time again while writing these Colour Collaborative posts over the last sixteen months, is how often the most harmonious colour combinations appear in nature first, and then are replicated in other forms like fabric or decoration. Mother nature always looks good. She always matches. 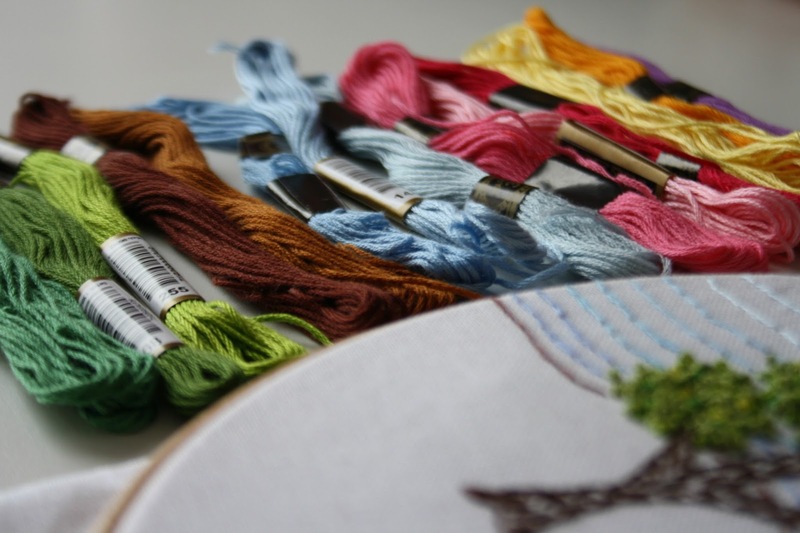 What about you - do you think your attitude to colour in your stitched projects changes with the time of year? 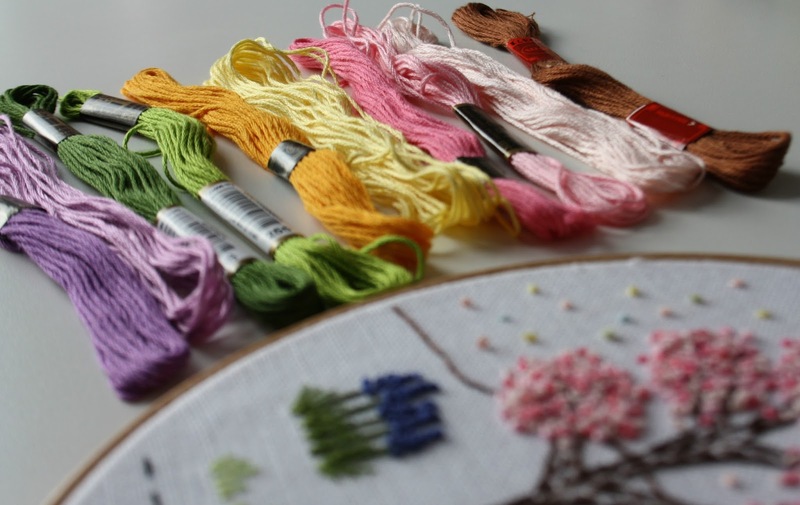 I know us crafters often turn towards yarn-based projects as the months turn cooler, and start planning scarves and blankets, but do you think your colour choices are also different in winter to summer, in autumn as opposed to spring? 9 am, and I've snuck back into bed with a cup of tea and my book. The sun is shining, it looks like it might be a nice day. 10 am. We're all up and ready, beds are made and rooms are tidy. 11 am. In our local park, letting the kids blow off some steam. 12 noon. Back home with Radio 4 on in the kitchen while I make a start on some bramble jelly. 1 pm and it's lunchtime. Bacon sandwich and brown sauce. 2 pm. A crafternoon is calling and the modelling clay is out. Bella made cave people for a project she's doing about the stone age. Angus made an alien and a monster. I made beads. 3 pm. One hour later and the figures are baked, cooled and dressed. Tomorrow I'll buy some grey paint so Bella can finish her paper mache cave. 4 pm. John gets home from work. 5 pm and we go out for fish and chips for tea. This time with just the four of us is welcome and precious. 6 pm. Dessert. It's called a Brandy Snap Dream. I've never yet eaten a whole one but I keep trying. 7 pm. A bit of Octonauts viewing before bed, his reward for getting through the Sunday night chore of reading book and spellings. 8 pm. Sofa, a cup of tea, an episode of Lilyhammer on TV, some crochet. That pleasant Sunday night slump feeling. A photo an hour (ish) over a whole day. It's fun to do this, to remember to get the camera out and use it. It's a pretty typical Sunday all in all, nothing special, just a lot of pottering around the house. How did you spend your Sunday? 1. This morning, after dropping the kids at school, I went for a walk. Twice this week I ran past the same bramble bushes and wanted to pick some fruit before the season finished. It's a pretty walk, even on the most grey and damp of mornings, and I spent a peaceful hour enjoying the solitude. 2. My bounty: 3 pounds of fruit, ready to be turned into jelly and crumbles over the weekend. 3. New earrings (from etsy) to go with a new little black dress which has a copper zip down the back and, more excitingly, the opportunity to wear both tomorrow night when we go out into town for a friend's birthday drinks. 4. I don't know if it's because the nights are drawing in, but this week I've really enjoyed going up to bed early with some herbal tea and a book. I make myself a little nest in bed, with lots of cushions and pillows, and settle in for a good hour of reading. Crime fiction is often my preferred genre when it's dark outside, and I'm currently enjoying this and can highly recommend the whole series of books. So, some quiet happy things to end a quiet, busy week. We've all been fighting off various germs lately, trying to keep coughs, colds and viruses at bay with mixed success. It's the time of year, of course. It's been damp and mild here, sometimes humid, which kind of annoys me - I wish it would just cool down more now so that it feels properly like autumn. Cold, crisp and sunny, that's what I'd like please. I've got new woolens to wear! September. A month of transitions and new starts, the end of summer and the beginning of autumn. Holiday memories are fading with the long days as the nights draw in. It's month for foraging and harvest, for planning and preparation. 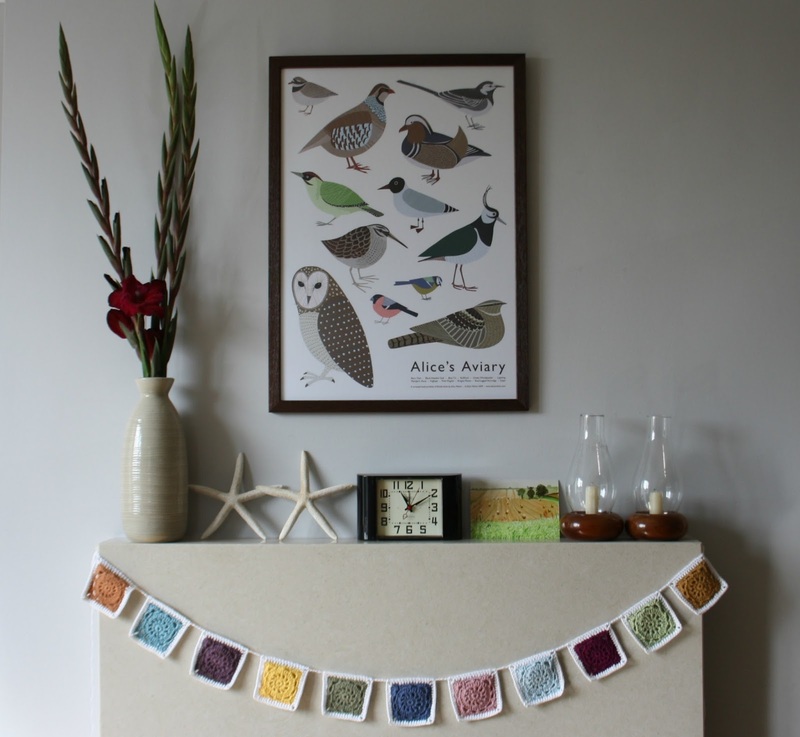 On my mantel this month: A crocheted garland which reminds me of bunting and beach huts and two star fish bought on holiday in St Ives. I like to keep these reminders of summer up for as long as I dare. A bunch of gladioli in a chunky cream vase. I like the way their shape says summer but the tones of their green stems and dark red leaves hint at the months to come. A Hockney postcard bought in Saltaire over the summer holidays and two candles in glass and wood holders, a gift from my Granddad. And the clock. The clock is always there. Would you like to join in? Do you have a particular area in your home, a mantel, kitchen dresser, table or shelf, that marks the seasons and the rhythms of family life for you? It's not about styling or making things looks beautiful necessarily (although that is fun). It's more about the meaning behind beloved objects and pictures, and the place nature has in our lives, and the way we humans like to surround ourselves with treasures and memories throughout the year. We didn't make it to the coast this weekend, but we still found ourselves by the water. We decided at the last minute on Thursday night to join John's family who were staying in the Lake District over the weekend. We drove up on Saturday, stayed one night, then back to Leeds on Sunday. A flying visit, but still a very restful one. We walked to the edge of Lake Coniston, Bella and Angus taking turns to hold the dog's lead. We collected treasures not usually found in the city, like wool or "sheep fur" as they called it, and white feathers. We climbed and explored. Back at the campsite, we sat outside drinking tea and chatting, listening to the silence. There wasn't a breath of wind, it was so quiet. Not wanting to cook much, but knowing we were in the middle of nowhere, we'd brought lots of nice M&S food with us, posh ready meals. We sat around chatting with John's parents and drinking wine, feeling cosy in our mobile home as it got darker outside. On Sunday morning we woke to sheep wandering across the campsite. We pottered in our dressing gowns and I actually read the paper for the first time in ages. We did the crossword while we drank our coffee. At home I wouldn't make time for that, I'd be too busy doing something non-essential. It was nice to be fully in the moment. After breakfast we drove into Coniston and wandered around some more. The lake is quite hypnotic - we must have spent an hour just sitting in front of it while the kids threw stones, watching boats come and go, looking up at the hills. The Lakes are such a magnetic, calm place, quite unlike the Dales. The mountains are all around you, all of the time and you are quite literally in their shadow. It all feels a bit Arthurian. On a grey day I can see how it might feel oppressive. But this weekend, in the hazy, cloudy warmth, with the leaves and fern just beginning to turn from green to brown, with autumn just around the corner, it felt calm and tranquil. Restorative.